What did Curiosity find on Mars: Jimmy Hoffa? Tang? Bite-marks on Mars. NASA’s Mars rover Curiosity used a mechanism on its robotic arm to dig up five scoopfuls of material from a patch of dusty sand called “Rocknest.” Each of the pits is about 2 inches (5 centimeters) wide. A sample from that fifth scoop was analyzed by Curiosity’s Sample Analysis at Mars (SAM) instruments inside the rover. 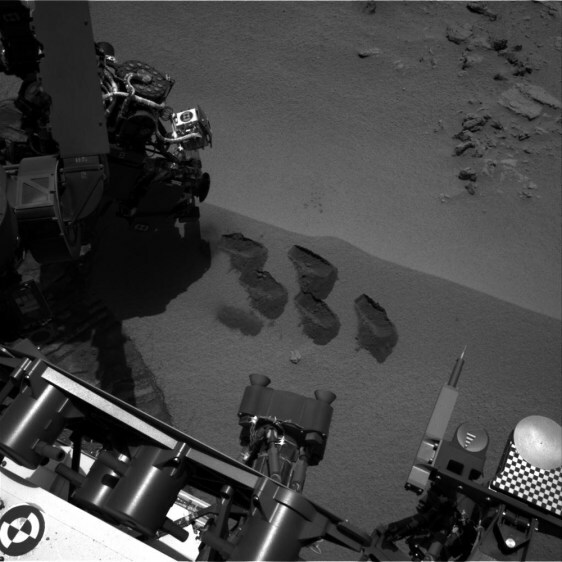 A second sample from the same scoopful of material was delivered to SAM for analysis on Sol 96 (Nov. 12).